Download the file (DB 2 Order Import File - Data.csv) attached to this page. 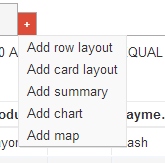 Add a row layout -- click on the red plus sign. 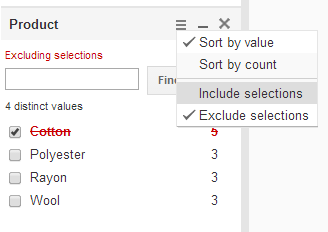 Multiple filters can be added to perform more complex queries. All cash orders over $400 except for cotton ones. All purchases not made by General Weavers and with a selling price of less than $1500 and greater than $500. Once a filter has been added to a row layout and a new Summary Layout is added, the filter is also applied to the Summary Layout. This filter can be remove without remove it from the original Summary Layout. Once a filter has been added to a row layout, it can be exported as a .csv file for further processing. This type of query is harder to keep as each require its own layout to remain active.